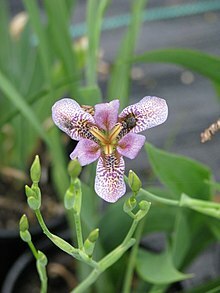 Iris dichotoma Pall., Reise Russ. Reich. 3: 712. 1776. Pardanthus dichotomus (Pall.) Ledeb., Fl. Ross. 4: 106. 1852. Evansia dichotoma (Pall.) Decne., Bull. Soc. Bot. France 20: 302. 1873. Pardanthopsis dichotoma (Pall.) L.W.Lenz, Aliso 7: 403. 1972. Iris pomeridiana Fisch. ex Klatt, Linnaea 34: 612. 1866. Evansia vespertina Decne., Bull. Soc. Bot. France 20: 302. 1873. Pallas, P.S. von (1776) Reise Russ. Reich. 3: 712. This page was last edited on 26 December 2018, at 13:09.